You are here: Home › Digital Marketing › How do B2B marketers segment content? 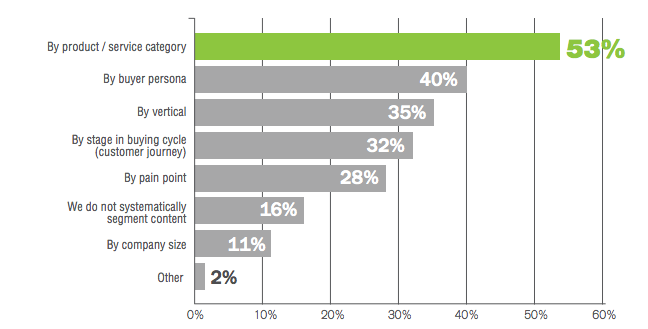 How do B2B marketers segment content? Marketers… listen up. Content marketing is the single most important demand generation activity you should focus on in 2015. Hands down. The Spiceworks-sponsored B2B Marketing Content Report from @HolgerSchulze is full of interesting insights around B2B content marketing best practices. But for me, it all revolves around the “why” of that content. If you’re not devoted to generating awesome content and content to drive folks to that awesome content, then take a look at this report. Why do I consider this ‘most important’? In B2B technology, we’re too “content” to develop marketing materials based on products, features, etc. Once upon a time, that was okay. Today, if you’re a technology vendor like Apple you can probably lead with product. But you already own a very defined brand. Business consumers understand your main value prop. Now, pretend you’re Xerox or EMC. Both companies have strong core legacies. But if you’re in Xerox’s services organization, you might find it a hard sell positioning Xerox financial outsourcing to an accounting firm that isn’t in the market for a copier. Looking at the slide above, you see B2B marketers are still focusing on product literature. That’s all well and good, but when a potential customer has a problem in need of a solution, product names and high level positioning might not be the best introduction. I’m glad to see persona, buyer stage, and pain point are each on this chart. Those are key drivers you should develop content around. But certainly don’t abandon those whitepapers and brochures… or at least the content that goes into them. Can content be sartorial, or, what’s inside your envelope? Late night TV fans might recognize Carnac the Magnificent. 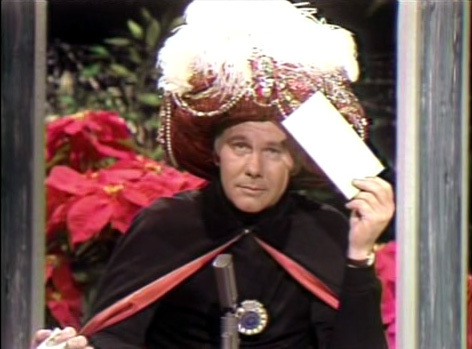 It’s a classic bit where John––, er, Carnac, would mention an “answer” and the question for that answer would be inside that sealed envelope. In meetings, I’m known to hold perfectly content rich whitepapers–not unlike Carnac’s envelope–and ask how many blogs posts, tweets, videos, or infographics could be derived from that document. I like to think it’s clever. At the very least, it breaks the ice and helps open a dialog on how existing content could be used differently. Another approach is to segment content from rich whitepapers into different “flavors” appealing to different personas. Your business user is approaching a problem differently than an IT user might. The former might be focused on features and outcomes while the latter needs to ensure technical specs will work in your organization’s environment. A finance-focused buyer might look at competing solutions to see which fits best in her budget. In other words, there are many perspectives to consider. So, continue researching your solutions against the competition. Keep your subject matter experts engaged. But be the marketer and use a mix of tactics and approaches to see which bait catches the most fish. After all, the expertise and value is clearly there. Why not create some extra magic with it?